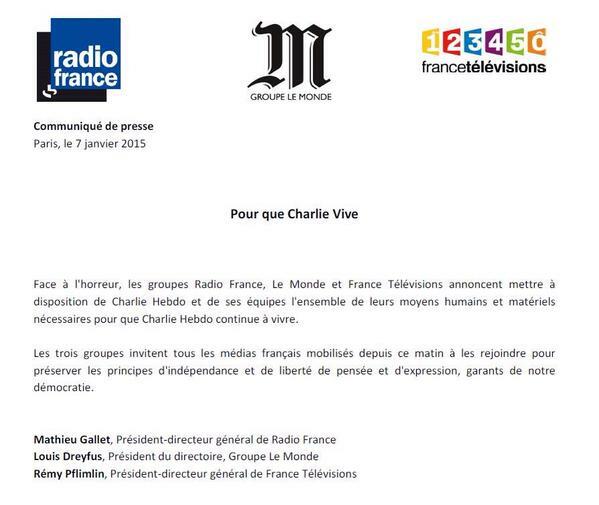 French news outlets and journalists will strive to ensure that Charlie Hebdo is not silenced by terror. Gunmen targeted the satirical newspaper’s Paris offices Wednesday, killing 12 people, including the editor and chief cartoonist. But, despite the horrific threat to press freedom, the paper will continue to publish. In a joint statement released Thursday, Radio France, Le Monde and France Televisions pledged to provide assistance. “Faced with horror, Radio France, Le Monde and France Televisions announce they are willing to provide Charlie Hebdo and its team with as much human and material resources as necessary to ensure Charlie Hebdo continues to stand.